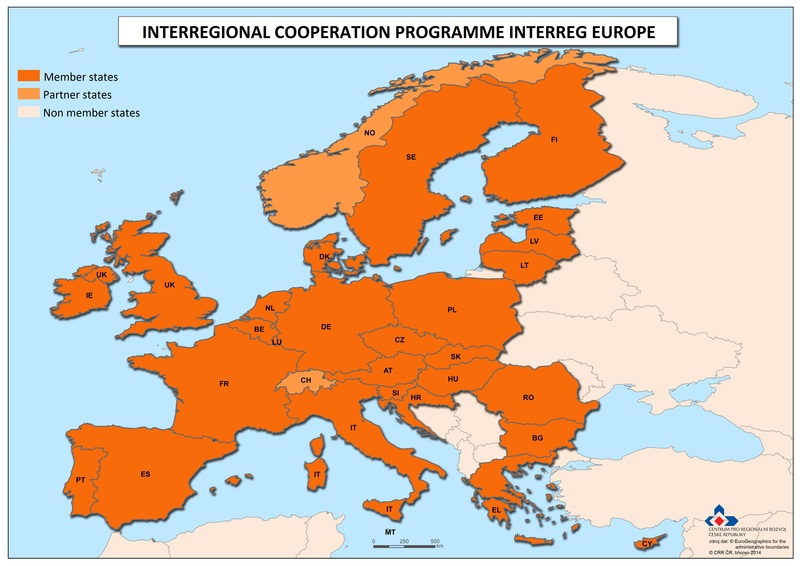 The interregional cooperation programme INTERREG EUROPE follows, in the 2014–2020 period, on operational programming period of interregional cooperation INTERREG IVC implemented in the programming period 2007–2013. The programme covers the entire territory of the EU and Switzerland and Norway. The INTERREG EUROPE programme financed from the European Regional Development Fund (ERDF) strives to support mutual policy learning among public bodies with the aim to improve functioning of regional development policies and programmes. It allows public bodies across Europe to exchange practice and ideas related to the manner of functioning of public policies, thus finding solutions to improve their development strategies. Public bodies, public institutions and private non-profit entities may participate in the projects. Projects will be financed by the ERDF in the amount of up to 85% of eligible expenditure for public and public-law beneficiaries and 75% for non-profit private beneficiaries. The Nord-pas-de Calais region, with its seat in Lille, France, is in charge with the programme management. a) Cooperation projects: partnerships of public organisations coming from different European countries, cooperating for 3 to 5 years, through exchange of experience related to various thematic areas with the main objective to improve implementation of Objective 1 and Objective 2 programmes. Each region participating in the project will have to create an Action Plan describing how the project results in that region will be further used and implemented in practice. Projects will also have to monitor how to apply the Action Plans in practice. Calls for project submission will be announced gradually during the programming period. b) Policy Learning Platforms: space for continuous learning, where any organisation dealing with regional development policies will be able to find solutions to improve public policy management and implementation in the above-mentioned thematic areas. To search for a potential partner or insert your own project proposal , use, after registration, the sections on the website of the INTERREG programme.